"Following the horrific murder of Sophie Lancaster in August 2007, her family wanted to ensure a lasting legacy to their beautiful, bright and creative daughter. In April 2013 Greater Manchester Police as a direct result of working with the Foundation became the first Police Authority to monitor Hate Crimes against Alternative Subcultures, we now have 16 Police Forces on board. We've attended Bloodstock since 2009 when they renamed The Lava Stage to The Sophie Lancaster Stage, it means so much to be a part of it every year and we look forward to meeting and speaking with you all!" 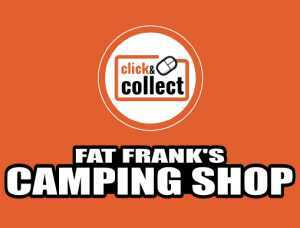 This year Fat Franks campsite shop situated in the Midgard campsite, will be on site to cater for your every camping need, offering everything you could possibly want for a great weekend of camping. You can use our free and easy click & collect service to purchase everything you need before you get to the festival and simply collect on site. No worries about having to fill your car or backpack in advance. Get yourself kitted out for Bloodstock at fatfrankscampingshop.com We also offer a fantastic airbed inflation service, saving you time and effort bring us your airbed and we will inflate them for £2 each whilst you wait. See you all at Bloodstock & happy camping. 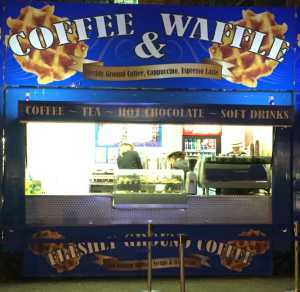 If you enjoy fresh coffee, variety of hot and cold drinks and food on the go, the coffee and waffle outlet is just the right place for you Our finest fresh ground coffee beans are so popular with coffee lovers, whether it’s a Latte, cappuccino, mocha or double espresso, our trained coffee barista’s will put together anything you require, why not enjoy your coffee with a slice of our fresh homemade cakes, if this doesn’t satisfy you we provide Belgian waffles, filling enough to have for breakfast, lunch, dinner or just as a snack, enjoy the toasted waffle with our variety of toppings and topped off with fresh cream. Amongst other cold/hot drinks provided on the coffee and waffle outlet, is a variety of tea, which is great also for those tea lovers, to which we offer different flavours, and vast selection of tea pigs, in particular our most popular brand Yorkshire tea! One of the most satisfying hot drinks we serve is what we call the works hot chocolate, which includes cream, marshmallows, a Cadbury’s flake and topped off with chocolate sauce – we guarantee this will leave you fully satisfied!! Our Ranch House 5oz beef burgers are sourced from a reputable supplier and are made from 100% beef loaded with freshly prepared Lettuce, Beef Tomatoes, Onions and a choice of Stilton or Cheddar Cheese add more toppings for the bigger appetite such as, Mushrooms, British Back Bacon & Onion Rings all served in a yummy brioche bun with a choice of sauces. Our chicken fillet burger, are also loaded with the toppings of your choice! Make it a meal with fries or onion rings on the side! We use local quality produce and all our ingredients are freshly prepared on-site and extra tasty! We are a small family run business and we love what we do which shows in our enthusiasm for the food we serve! 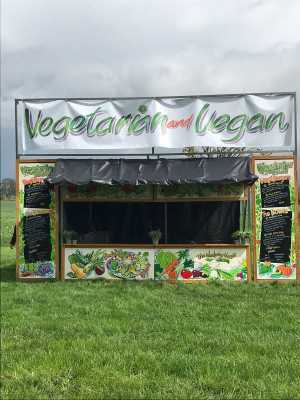 We are two sisters who have been working in the festival industry for several years, we branched out on our own three years ago, having inherited a small modest catering business consisting of two catering trailers. 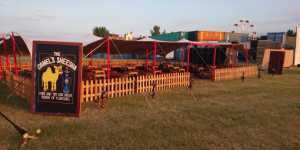 In the three years’ we have turned these outlets around giving them a funky frontage and offering high quality freshly prepared foods to hungry festival goers. Serving from cast iron skillets our Mac N Cheese outlet offers freshly prepared Mac N Cheese with an option of mouth-watering toppings. For the last 12 months we have been perfecting Our Mac N Cheese, which is made up of Elbow pasta smothered in a 3-cheese sauce (Cheddar, Mozzarella, Parmesan) and stacked high in a Mac Pot with a choice of Meat or Veggie toppings. Being passionate about our food, Big C’s uses only the best ingredients, which is lovingly served with a smile and a hint of Banter!! 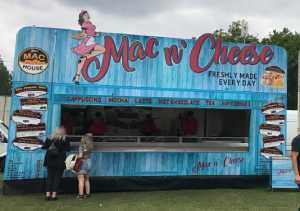 Download 2018 will see a new product being introduced THE MAC WRAP: - all the delights of a Mac Pot rolled into a soft tortilla wrap!! It’s all in a wrap!!!! The Chicken Shop is the place to be at any event. With its Latino, hip hop beats playing throughout the day on our custom-made shipping container, Chicken Shop isn’t just another catering unit, it’s an experience. Serving delicious fried chicken, you can’t go wrong at the festivals best Chicken Shop. 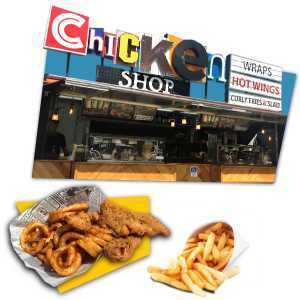 Chicken shop serves a delicious choice of fried, breaded Chicken, including Goujons, Wraps, Chicken pieces and wings as well as the nation’s favourite…..Curly Fries. With the choice of many different sauces including original Jack Daniels Sauce, Peri Peri Sauce, Homemade Slaw, and Thai sweet chilli. 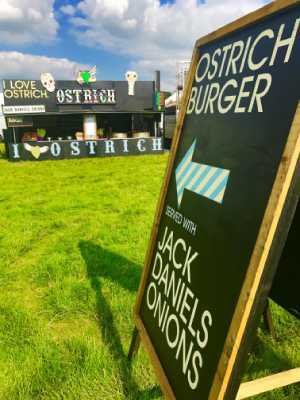 Our totally unique ostrich burger is by far the healthiest burger available, served on a toasted brioche bun with seasonal leaves and a choice of 3 fantastic toppings- Colston Bassett Stilton mayonnaise, jack Daniels onions and blow torch cheddar! We also sell sweet potato fries! Mmmmmm Cheesy! Cos we had the cheese ‘n’ it’s melted! 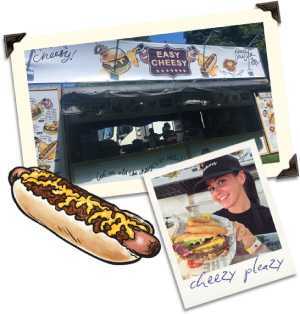 Burgers, Curly fried and Foot Long Cheezy Dogs all covered in our Eazy Cheezy sauce, For all those cheese loving festival goers, who doesn’t love our Eazy Cheezy sauce!! Our Eazy Cheezy units will be heading to festivals and events all summer long, so be sure not to miss out as it really is the ultimate festival food Seasoned prime beef burgers, served in a brioche bun, with Salad, and onions covered in our Eazy Cheezy sauce topped with an onion ring. Why not try our Curly Fries topped with our Eazy Cheezy sauce, or even the Footlong Cheezy Dog? 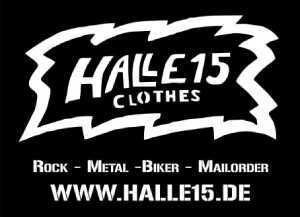 "metalmailorder.com (TWS-Source of Deluge) is a mailorer, distribution, label and service - company based in northern germany. We deal with every kind of metal / AOR and all the things arround. 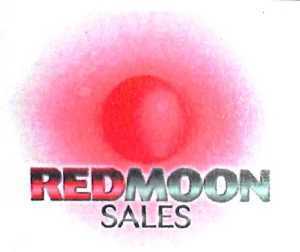 Allways more than 25.000 different articles on stock." 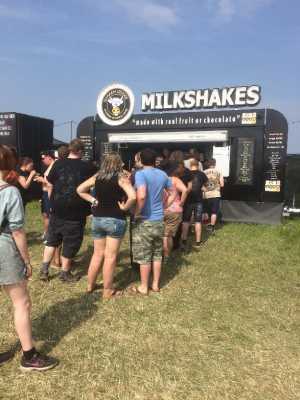 Milkshakes Shaken Udder began its life as a festival regular back in 2004, bringing fresh, tasty and healthy milkshakes to music and milkshake lovers across the UK. We pride ourselves on producing high quality milkshakes made from fresh British milk, real fruit or chocolate & lush Ice Cream. Festival sustainability is very important to us which is why all our milkshakes are served in biodegradable branded cups with cow print paper straws. Our menu caters for gluten free and vegetarians, with 20 flavours to choose from, there is something for everyone from the fantastic originals to chocolatey goodness. Customer service is important to us therefore we ensure every milkshake is made to the highest quality before it’s served, this includes the perfectly placed whipped cream on top. We’re a friendly bunch here at Shaken Udder so don’t be shy, come and share with us your favourite flavour of milkshake. We love a good flavour debate! An All-Yorkshire Pudding Menu & We’re Into It… The best thing to come out of the North is taking centre stage on our plates & the festivals… Our classic British menu consists of the famous Real Yorkshire Pudding Co’s giant puddings oven cooked to crisp perfection with a variety of tasty fillings. Choose from roast Welsh shoulder of pork or the olde faithful English pork sausage with a selection of crackling, creamy mash, sage & onion stuffing, onion gravy, Heinz baked beans or Bachelor mushy peas. Fill your boots! Our special “The Hungry Festival Goer” is a must – not only generous in portion but excellent value for money. You’d be a pudding not to give it a go… We pride ourselves on our traditional British offering & always use responsibly sourced British produce showing our support for British Farmers & Producers. And if you don’t believe us…try one; as the proof is in the pudding! Paellaria a Valencian Paella stall with a retro feel, all hand painted signs, flamenco fabrics and vintage holiday memorabilia, a celebration of the ‘Brit’s Abroad’ Iberian holiday of yesteryear! All our food is 100% homemade onsite using only the finest Spanish ingredients. 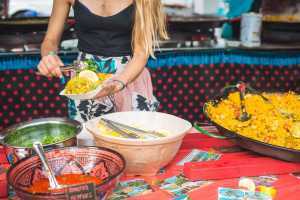 We source all our rice, olive oil and olives ourselves from boutique suppliers in Valencia so we can create the most authentic Paella on the UK festival circuit! Our UK suppliers include Brindisa (for our famous Chorizo) and we only use ‘RSPCA’ assured chicken. We have a network of local butchers and green grocers across the country so our chicken and fresh vegetables are always sourced locally. All our food is Gluten Free and our Paella de Vedurus is Vegan. In 2016 we were shortlisted for "Caterer of the Year" UK Independent Festival Awards and also shortlisted for "Concession of the Year 2014" at the UK Festival Awards, we are proud winners of that same award in 2012! Wandering Veggie, gracing you with our presence for 2018, serving healthy well-balanced food this festival season, giving you stamina to enjoy your festival to the fullest. Packed with flavour, goodness & prepared with a whole lot of love! Our bowls are totally vegan, low fat & gluten free! 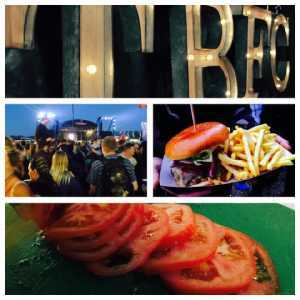 We also serve Vegan Burgers for those who fancy a festival classic! Meat free doesn’t have to mean taste free! Let your taste buds have a mini festival of their own by treating them to our ‘feel good bowl’. Warming Moroccan spiced chick peas cooked with garlic onions and tomatoes, served on a bed of rice, topped with fresh herbs & crunchy tortilla dippers. See you in the field! 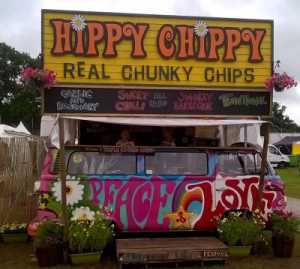 After trading at festivals in the UK for close to 15 years, we decided to change the way Chips were sold at events. We make Chips from potatoes on site. The method has been refined over the years and we now have what we believe is the perfect Chip, triple cooked, crispy on the outside and perfectly fluffy on the inside. We serve the Chips with a variety of sauces, dips and sides. In addition to the obvious favourites of Heinz Tomato ketchup and Hellmann’s mayonnaise we now have a amazing range of Dutch sauces and mayonnaises. 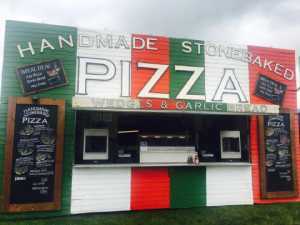 We named Number 1 food trader at Glastonbury 2016 by Chris Evans on the BBC. Our packaging is simple and biodegradable – Dutch bio paper cones wooden chip forks. We produce virtually no landfill waste. The packaging we receive our stock in is completely recyclable this means that we produce only recycling (plastic/metal/card) and minimal food waste. All of our used rapeseed oil is recycled as biofuel. All of our stand lighting is LED powered dramatically reducing our power consumption. We are 5 Star rated by the Food standards Agency. We are passionate makers of delicious hand-made pies using locally sourced ingredients, served with generous portions of hand-made creamy mash or lush chunky chips, proper gravy and mushy peas. We take great cuts of meat and the freshest vegetables from as close to where we make the pies as possible. We have proper chefs mix them all together and cook them properly. We make lovely short-crust pastry and stuff as much filling in to it as is possible. We also sell Fairtrade coffee, Yorkshire tea, and soft drinks. We have over 15 years worth of experience on the event circuit. 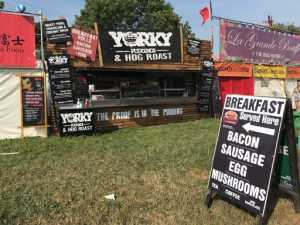 You can find us at festivals such as Glastonbury, Wilderness, Secret Garden Party, Bestival, Camp Bestival, Festival No 6, End of the Road, Green Man, Beautiful Days, Rewind, and Sonisphere, as well as Twickenham, Hampton Court Flower Show, Gatcombe Horse Trials, and Winter Wonderland in Hyde Park. 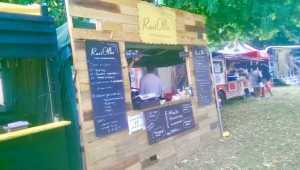 We are a new and exciting food brand, specialising in homemade ravioli. Having worked in some of Londons finest restaurants including Michelin starred restaurant Medlar, Our chef and founder Ollie has created an artisan, gourmet range of ravioli that any top restaurant would be proud to serve. We want to bring restaurant standard ravioli and make it more available to the public through a new street food concept. I am very proud to say that we received the highest level of feedback having won the NCASS award for taste last summer, in a competition judged by Michelin stared chef Nathan Eades at WOMAD festival 2017. SUSTAINABILITY IS OUR CORE FOCUS. We personally select the butchers that supply us with our ingredients for our fillings to ensure we ONLY use free range and locally sourced produce. Sustainability is an important part of the business and that is something we don’t compromise on QUALITY AND FRESHNESS IS KEY Whether it is a vegetarian or meat based filling, we strive to keep the menu fresh, flavoursome and exciting. We change our fillings seasonally as we endeavour to ensure the quality remains consistently high throughout the year.
" The Burrito boys are professionally trained chefs and their food tastes simply amazing. The burritos are huge and the fillings are loaded up right in front of you and a lot goes in them. There is smokey chicken, orange braised beef or the veg option chipotle mushrooms. They are served with roasted lime tomato salsa, sour mint cream, salad, roasted chilli sauce, cheese, guacamole, green rice and black beans. The boys make all of their own marinades and sauces and you can see them preparing and cooking all their food fresh daily. They also do amazing breakfast burritos, quesadillas and tacos. 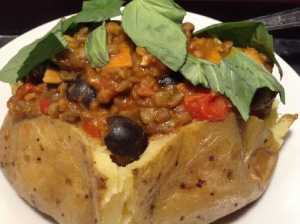 As chefs they use fresh herbs and English meat only and the best quality ingredients. You will not be disappointed with one of there beast burritos bursting with amazing textures and flavours." We will be your local supermarket for bloodstock open 24 hours a day , anything you have forgotten feel free to pop in , we will have everything your local supermarket would , including medicines , drinks, confectionary , tobacco and cigarettes , lighters and all your bits, bread milk and snacks , all your toiletries and everything in between, so if you have forgotten anything don’t worry , pop down and see us and all our happy staff and we can sort you out so that you can have the best weekend possible and enjoy Bloodstock to it’s fullest . 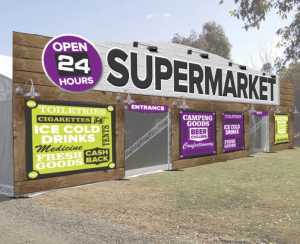 We sell tobacco and tobacco/nicotine free flavours with wide variety at the customers preference. We do everything possible to ensure that we provide an excellent customer experience from comfort to great sheesha. Our staff are very friendly and easily approachable and are willing to help as much as they can. Alternative Jewellery and Accessories for those who like to live Dark. 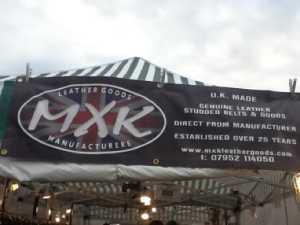 MXK LEATHERGOODS ARE MANUFACTURERS OF GENUINE LEATHER BELTS, WRISTBANDS, NECKBANDS, BOOTSTRAPS ETC, WITH CONICAL, SPIKE AND PYRAMID STUDS, MADE FOR ROCKS, PUNKS & GOTHS. ALL OUR GOODS ARE MADE IN THE UK. Dr. Steel is a quality metal shop for serious metal collectors. Selling CDs, vinyl, patches & shirts on the European mainland for over a decade. 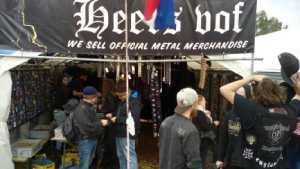 Visiting Bloodstock for the very first time. We're happy to see you guys at our stall. Cheers! 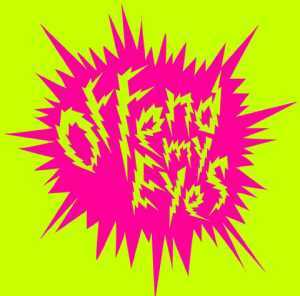 Eyesore Merch was started through our love of music and entertainment. First and foremost we are music fans and love nothing more than attending live shows and seeing our hero’s in the flesh. From tiny sweaty clubs to quality music venues all the way through to outdoor festivals big and small, feeling the music and seeing the bands perform is the biggest rush there is. Wherever we go we like to show our allegiance to the music we love by wearing our favourite band T-Shirts and merchandise. Here at Eyesore Merch we not only offer you a huge selection of music merch but also stock a large range of Movie, TV, Comic Book, Video Game and Branded items. We're a small team dedicated to offering a unique range of hardwearing jewellery for both men and women, from silver axes to steel skulls we've something for everyone. We look forward to seeing you all at Bloodstock 2018. "From the sunny south of France, Season of Mist leads the Heavy Metal Hordes while bringing hell to earth. 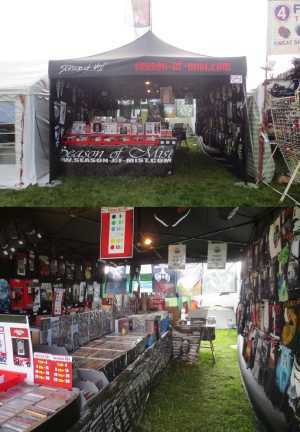 Join us during Bloodstock and grab CDs, LPs, Patches and of course, lots of merchandise! From Season of Mist and from our distribution. Metal maniacs, we have what you need! From MAYHEM to SOLSTAFIR without forgetting SEPTICFLESH (playing this year), WATAIN(playing this year), BENIGHTED, TSJUDER, HEILUNG, ROTTEN SOUND, SHAPE OF DESPAIR or DRUDKH . Hope to see you there! And get our Hellish quality stuffs, our smiles and our French cheese perfume!" 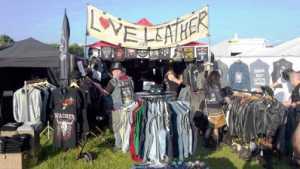 LOVE-LEATHER sells vintage and recycled second hand clothing. We specialise in vintage denim, leather biker gear, dresses, velvets and fun-furs with a few sequins too!. We source and rework party clothes for festival goers. We also have period retro accessories, hats and hand-painted jackets. Stock is all recycled, fair-trade and sourced from the UK. We are the Big Fat Cow Burger Joint a family run business and we are proud to serve gourmet beef burgers using locally sourced beef loaded with freshly prepared lettuce, tomatoes, and red onions all served in a brioche bun. 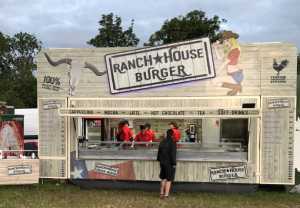 Will you go for the Spicy Cow loaded with jalapenos, spicy sauce and a slice of mature cheddar cheese or the Brothers Burger with monterey Jack cheese, bacon and homemade Brothers cider sauce? We also offer the Vegie Cow serving grilled halloumi cheese, mushrooms, lettuce, tomatoes and red onion all served in a brioche bun if you don’t fancy the meat! Our fries range from Original to Dirty Fries loaded with aged American Cheese Sauce and Bacon! We love what we do and we love our burgers, we hope you do too! Been partying hard? Need some time out from the mosh? What could be better and more relaxing than a nice cuppa?... A Cuppa & A Massage! 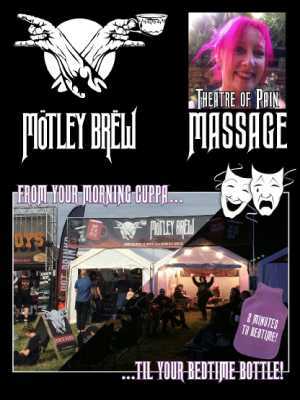 Motley Brew & The Theatre Of Pain Massage have teamed up again to provide you with the perfect retreat. As well as the usual Motley Brew’s hot beverage selection, served from early morning to late evening, we are delighted to bring you the skills of one of our fabulous massage therapists. Nina is a fully qualified therapist with 16 years professional experience helping festival revellers relax and unwind, leaving them ready to rock! Whether you are looking for a quick fix whilst your friends are getting the teas in or are in need of a bit more pampering (or pummeling!) between sets, Nina can provide a wide range of treatments to suit. Energising quick stop massage 15 minutes invigorating seated massage focusing on the upper body. Great for sore backs, shoulders and neck. Indian head massage Relaxing or reviving seated massage focusing on the shoulders, neck and scalp. An ideal treatment to clear your head, loosen those shoulders and leave you ready to enjoy the party. Couch massage with warm bamboo In need of a bit more down time? Enjoy a couch based massage using warm bamboo to roll out any aches and pains and really unwind. Feet up time Get your boots off, lay back on the couch and give those feet and legs a well-deserved rest! A sublime mix of reflexology and leg massage to revive and restore your balance. Slots can be booked in advance to fit in with your busy band schedule. We are a family run business called P3 Earth Designs and make ladies clothing and accessories. Alongside our own brand which we have been producing for over 10 years we sell a range of goods which fall into our fair trade policy which is in line with BAFTS. These include: hand-painted parasols, hand-painted fans, Mexican Hergas, ponchos, ethnic headwear, leather hats, ethnic bags, retro puffer jackets. Glitsy dinner jackets and sequin dresses. We also strongly support a charity which we feel very strongly about called Safe Child Thailand because we have a very strong connection with the country and it touched our hearts when we saw and read into many cases of child abuse, abduction, violence. Welcome! 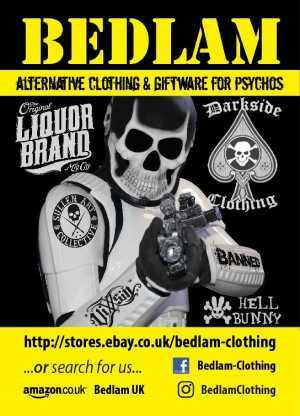 We provide alternative clothing, accessories and homewares with an edge. We have many returning customers and aim to provide you with a 1ST class service. Shop with confidence with us! SUSTAINABLE WEAR WITH A NORSE THEME. SHIPPING WORLDWIDE FROM THE DANELAW, UK. We are a norse themed sustainable clothing company based in Nottingham. Our mission is to tell the story of the norse gods and the impact of the viking age on world history through organic and sustainable clothing. We use only natural or recycled materials and hand craftsmanship whenever possible. We don't use plastic packaging and never will. 10% from all our sales go to environmental charities to honour the earth, our ancestors and the gods. We believe it is the duty of every business and individual on the earth, to better themselves and their society. Our connection to the natural world and each other, through virtue, thought, memory, poetry, stories, movement, sport, and great acts gives us our strength. 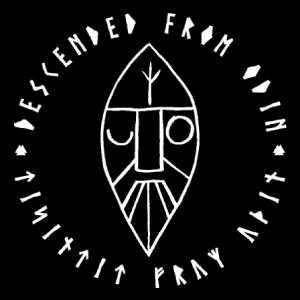 We are Descended from Odin. 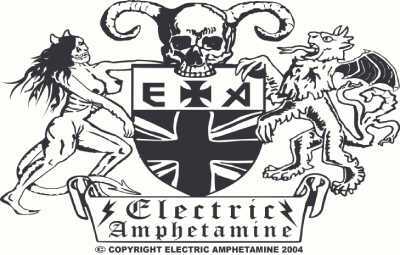 "Electric Amphetamine is an independent music merchandise company selling rare, hard to find, and Euro & USA import rock and metal t-shirts, long sleeve, hoodies, accessories and a massive choice of patches online (www.electric-amphetamine.com) and at festivals. Specialising in thrash, death and black metal, but also covering all genres of rock and metal, we are fans of the music and know what we're talking about. If there is a shirt you’re struggling to find, chances are we'll have it or we'll do our best to get it." 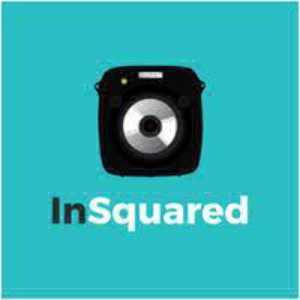 We at In Squared strive to create the very best in portrait photography, with a polaroid twist. 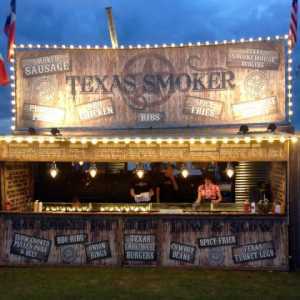 We work with a range of events from nightclubs and festivals to conventions and one time experiences, in the UK and beyond, to create a fun and exciting atmosphere. Our amazing group of photographers seek out the moments that make an event special and provide people with customisable prints that make for great life-lasting mementoes. We are the premiere events photography company in the UK which specialises in the latest in Instax technology. This allows us to capture high-end, stylish images under almost any condition and print them right there on the spot. Interested in hearing more? Send us an outline of your project and we will curate a bespoke package catered specifically to your needs.